On February 26, 2018, Maria Artunduaga had a eureka moment that medical entrepreneurs dream of. 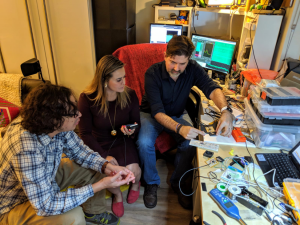 In the office of UCSF Professor Mehrdad Arjomandi, she was soliciting advice about a wearable prototype she had developed to monitor oxygen in patients with chronic obstructive pulmonary disease (COPD). Dr. Arjomandi—a clinical professor in the Division of Pulmonary, Allergy, Immunology, and Sleep Medicine and a foremost expert on COPD—was telling her about an air trapping investigation he had been doing for over a decade. He was bemoaning the enormous time and expense involved in testing patients with COPD, the third leading cause of U.S. deaths. Artunduaga knew these problems intimately. Her grandmother had died of COPD in 2013—and over the past decade, the 38-year-old from Colombia had earned a MD, a Harvard postdoc, a Master in Public Health, and a Master in Translational Medicine and had been obsessively trying to figure out a cost-saving device for the 328 million people worldwide suffering from the lung disease. 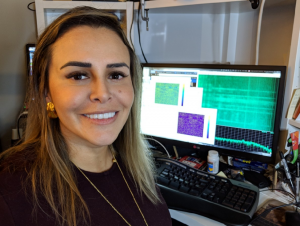 Artunduaga grabbed her phone and called her husband, Ricardo Garcia, who works as a technical lead on the Sound Amplifier project at Google. For years, she has been watching him probing phones for sound and experimenting with microphones, audio equipment, and the like. Since that time, Artunduaga has been in marathon startup mode. She pivoted her first COPD project, called KnO2 Sensor (which won third place in the 2017 Big Ideas Global Health category) from being a low-cost monitoring and evaluation wrist device targeted to Latin America—to a COPD solution that would be rolled out first in the United States. Artunduaga explains that the current methods for tracking respiratory disease are Spirometry and Pulse-oximetry, both patient-initiated interventions. They do provide data at discrete points when a patient uses the equipment; yet they often lead to delays in identifying lung function decline in real time. And this lack of timely information often results in expensive hospitalizations from late detection. Artunduaga’s startup, called Respira Labs, relies on a wearable technology that provides continuous monitoring to patients and doctors by detecting the trapped air in the lungs associated with COPD. 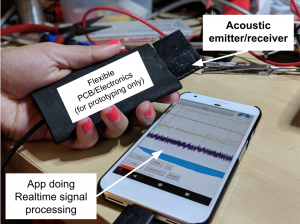 The invention is very much of the moment: it relies on low-cost audio sensors paired with AI algorithms on a smartphone platform that models and track the lungs’ resonant frequency, flagging any changes in lung function. According to Artunduaga, no one has ever tried to use sound to measure lung resonance entropy. Indeed, Respira’s Freedom to Operate patent analysis performed by UC Hastings College of Law found no similar patents over the past 10 to 20 years for air trapping measurement with sound. Respira filed two provisional patents, in April and November, 2018. To develop the idea and find funding for it, Artunduaga has been on an innovation contest tear. Respira Labs has been invited to four national innovation challenges, and chosen for Skydeck HotDesk and CITRIS Foundry Founder-in-Residence programs as well as the Y Combinator StartUp School. Respira also was awarded two grants of $25,000 from the National Science Foundation (NSF) and VentureWell in June and December 2018 to further customer research. Also in December, Respira was selected to move on to the U.S.-West regional finals in 2019 Global Social Venture Competition and the finals in the 2019 Big Ideas Contest in the Hardware for Good category. Some of this funding has allowed Artunduaga and her team to interview over 200 people—patients, doctors, nurses, respiratory therapists, regulatory and healthcare business experts, medical device entrepreneurs, and investors—to ensure the device meets both patient needs and medical industry demands. Likewise, Artunduaga’s initial ambition to introduce a COPD solution for the Latin American market got revised after rounds of interviews and research and field visits. One problem was the regulatory environment; according to Artunduaga, most Latin American medical systems are 10 years behind in terms of having the regulatory infrastructure to introduce digital health products. The other problem was funding. Artunduaga says she first believed the best way to address global public health issues was through academia and the public sector. But she soon realized that limited funding to those sectors cripples and delays projects that have the chance for large impact. Respira’s aim is to target all 700,000 COPD U.S. patients who are hospitalized every year by their physicians. The team, which includes Haas MBA students Nikhil Chacko and Nerjada Maksutaj, has investigated time into market research. They estimate that COPD costs the U.S. healthcare system nearly $72 billion a year—and half of that cost is attributed to emergency room visits and hospitalization. Because COPD is on the rise as a leading cause of death in the U.S. (it increased 44 percent from 1990 to 2015, they believe early detection could reduce the $36 billion currently spent on emergency room and hospital visits. Artunduaga says Respira’s next big challenges are to validate the acoustic lung resonance measurement, refine the sensor design and the long-term data capture using a mobile device application, and explore machine learning data analysis and prediction. Her team —which is mostly Latinx and half women— includes a mix of seasoned consultants and advisors: Ricardo Garcia, an MIT-trained engineer with 20 years of experience in audio sciences and data signal processing, is the lead advisor for technology development; Santiago Alfaro, an MIT-trained industrial designer with 10 years of experience, is working in wearable design and prototyping; Leonardo Perez, a EU-trained PhD in Mechatronics who is developing the sensing technology; Haas MBA students Nikhil Chacko and Nerjada Maksutaj are leading market research, business development, and fundraising strategies; Selene Mota, an MIT-trained Lemelson Inventor’s Fellow, is the lead advisor on user-centered wearable design; and Luis Serrano, a University of Michigan-trained mathematician, who leads Udacity Artificial Intelligence & Data Science teams, is helping develop the Machine Learning algorithms. Although she comes from a family of physicians —her mother is an ENT surgeon, her father is an anesthesiologist, and her sister is a pediatric cardiac and MSK radiologist—Artunduaga says they consider her choice to be a medical entrepreneur unconventional, because for them, a doctor should be doing clinical work and seeing patients. Yet Artunduaga’s multiple prizes, fellowships and awards—as well as her recent selection as Entrepreneur of the Year in Silicon Valley—is quieting their criticism somewhat. Artunduaga seems not to be terribly concerned. She is in a race against time and for funding. And she is not afraid to ask questions and make connections.